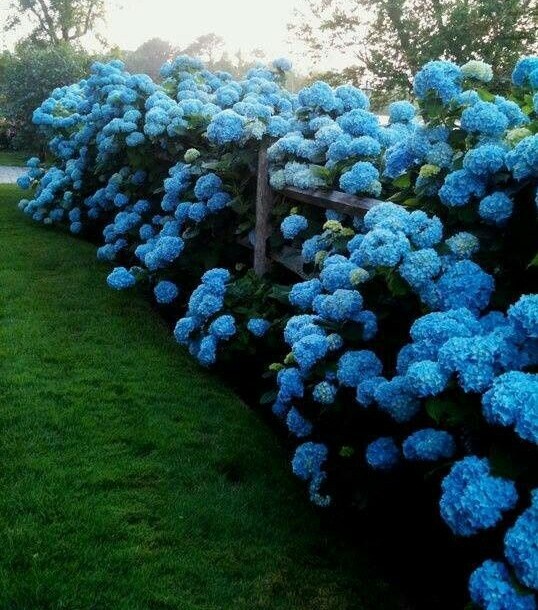 Hydrangeas are certainly one of the best loved garden plants of the American garden.Most homeowners that know nothing about plants can still identify the classic blue flowers of our most common hydrangea. As a garden designer, I get requests for “Hydrangeas” constantly.Whenever I do, I feel the need to sit my customers down and give them a long lesson on the subject.The truth is, the classic blue hydrangea is only one of numerous species and cultivars of Hydrangea available, and it’s usually not the best choice for most gardens (especially northern gardens).In this multi-part series, we’ll introduce you to the easiest and most beautiful Hydrangeas and help you to choose which is best for your home garden. 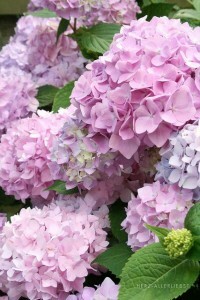 In this first part of the series, we’ll introduce you to the different types of Hydrangeas and how they function in the garden.Then, we’ll dedicate a following part to each of these and give you the tips you need to grow them successfully.If you’re going to plant Hydrangeas, it’s worth the time to get to know what’s available. There are some truly great plants out there that most homeowners are missing out on.Learn what garden designers have known for years.There is much more to Hydrangeas than the blue mop heads of your grandmother’s garden! Let’s start by getting to know the botanical genus Hydrangea.There are over 70 species of Hydrangea, but you don’t need to learn about all of them.And don’t worry, you won’t need to memorize their Latin names either!To get the best out of the Hydrangea genus for your garden, there are five different species you should know about.If you’d like to jump ahead and learn more about any individual species, just jump to the menu at the end of this post. Bigleaf Hydrangeas (Hydrangea macrophylla) – This is the most commonly recognized Hydrangea in American gardens.It has large green leaves and blooms with large flower heads in summer in various colors (most famously blue). Flower heads can be large and round (typically called mop heads) or flat and circular (typically called lace caps). 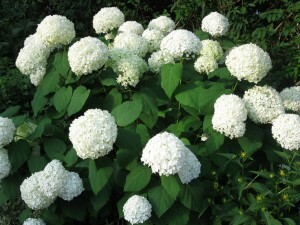 The bloom color of Bigleaf Hydrangeas can change based on the pH of the soil. PeeGee Hydrangeas (Hydrangea paniculata) – These Hydrangeas have woody stems and can be large shrubs that even resemble small trees.They can get much larger than the Bigleaf Hydrangeas and typically produce larger, white, cone-shaped flowers. Flower heads fade to pink in the fall. Smooth Hydrangeas (Hydrangea aborescens) – Smooth Hydrangeas look very similar to big leaf Hydrangeas, but typically have only white mop head flowers. 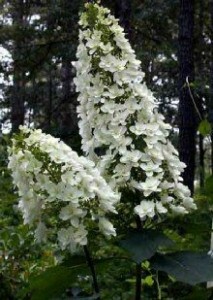 ‘Annabelle’ is the most common cultivar. The smooth Hydrangeas are favorites of shade gardens. 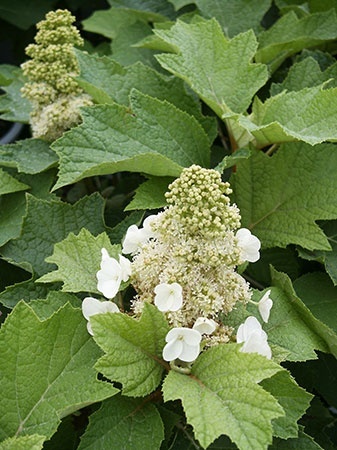 Oakleaf Hydrangeas (Hydrangea quercifolia) – Oakleaf Hydrangeas are also woody shrubs that can get larger than the Bigleaf Hydrangeas.The leaves resemble oak leaves and the bark of the shrub is exfoliating.The flower heads are white, long and cone shaped. Oakleaf Hydrangeas are most used in woodland gardens because of their natural, unmanicured look. Climbing Hydrangeas (Hydrangea anomala petiolaris) – As the name implies, Climbing Hydrangeas are large climbing vines that produce large, wide, white flower heads. 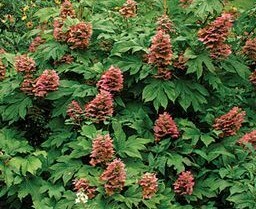 As you can see, there are a wide variety of different plants called “Hydrangeas”.Some are small, soft stemmed plants, while others are large climbing vines or small trees.Let’s talk about the benefits of each Hydrangea species, so you can get an idea of what you want in your garden. 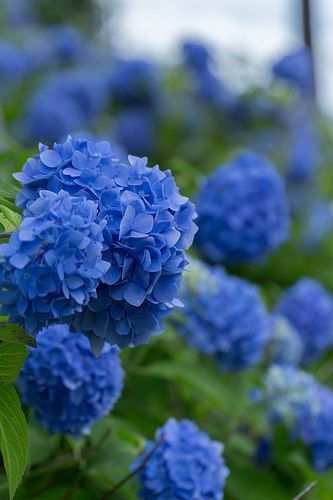 So, now that you’re aware that there are different types of Hydrangeas, let’s talk a bit about what each group has to offer.If you are really looking for that classic blue Hydrangea flower head, then you will need to stick with a Bigleaf Hydrangea. This group of Hydrangeas gives you that classic look in several different colors including blue, butthe flower color tends to change depending on the pH of the soil it’s planted in.So, don’t go by the color of the flower in the container at the nursery.The flower color will likely change once it’s been planted in your garden. Bigleaf Hydrangeas are also a fussy plant.They like sun, but can’t take too much heat, so in southern climates, it’s best to grow them in afternoon shade.If you do grow them in full sun, they will need lots of water in the summer. 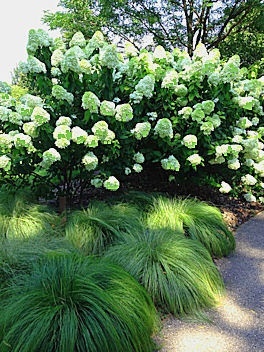 It’s common to see Bigleaf Hydrangeas wiltingduring heat waves here in Massachusetts.Bigleaf Hydrangeas are also sensitive to the winter cold and usually suffer from bud burn in cold windy winters in zones.We’ll give you more detail in our post on Bigleaf Hydrangeas (just click here). Hydrangeas offer the most blooms of all the garden Hydrangeas.They are large plants that bloom profusely and they are not fussy at all.They do not have any of the problems of the Bigleaf hydrangeas.However, they can get quite large, so they may not be suitable for any site.They also prefer lots of sun to bloom well.The smooth hydrangeas, on the other hand are also much less fussy than Bigleafs but prefer shady spots.They also stay the same size as the Bigleafs, so they are almost interchangeable in the garden.For more detail on the PeeGee Hydrangeas click here. You can learn more about Smooth Hydrangeas here. 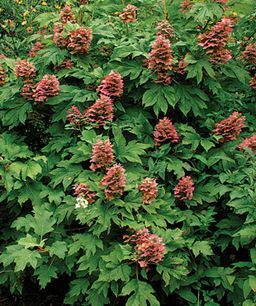 shaped flower heads that start out white, but turn beautiful shades of pink and red as the season progresses.In the fall, the foliage puts on a great show and in winter, the exfoliating bark adds interest until spring. 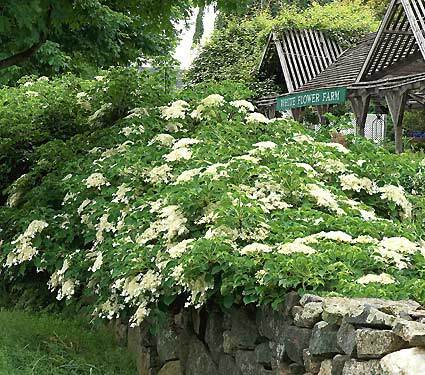 If you want to learn more about Oakleaf Hydrangeas, click here or just read on. 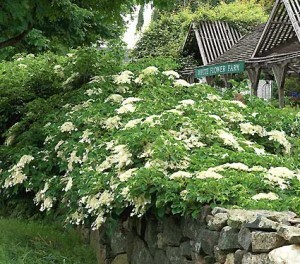 Finally, if you want to add some serious drama to your garden, the climbing Hydrangea may be just what you need.This large vine can grow over 40 ft. and produce hundreds of large flowers heads.It can climb up tree trunks or onto sturdy structures.In warm climates, it needs some shade, but typically still flowers well in shady spots. 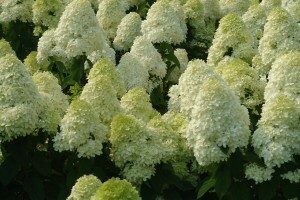 Now that you understand the different types of Hydrangeas, you can explore each type in more depth.Just click below to go to the next parts of our series on this great garden shrub.Learn how to grow and care for Hydrangeas in your garden and select the best cultivars to give you the garden performance you’re looking for. This entry was posted in Gardening, Shrubs and tagged annabelle hydrangea, big leaf hydrangea, bigleaf hydrangea, blue hydrangea, hydrangea, hydrangea aborescens, hydrangea macrophylla, hydrangeas quercifolia, hydrnagea paniculata, lace cap, limelight hydrangea, mop head hydrangea, nikko blue, oakleaf hydrangea. Bookmark the permalink.